It seems an easy route for developers and architects these days. Pick an object thatwould translate into an odd-shaped building, give it a cute nickname, and watch as Londoners fall in love with it. 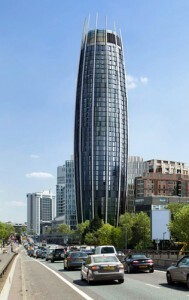 To wit: this 150m-tall building at Paddington Basin, variously being described as a lava lamp or a cucumber. The 41 storeys will be taken up by a hotel at the base and 220 residential units above, while the top floor will have a sky bar (Hendricks will presumably be the drink of choice). Merchant Square, as the development is officially known, comes from the fruitful mind of Robin Partington, a man who appears to have an obsession with bringing the five-a-day rule to London's skyline: during his time at Foster + Partners, he was involved in the design of the Gherkin. He also designed the Strata tower in Elephant & Castle. This project is his first since forming his own practice. London's skyline is set to become more salivating over the coming years: after nibbling on the Gherkin for a couple of years, the city will soon be able to chew on the Can of Ham, before sampling a slice of cheddar from the Cheesegrater (with the Shard as an extruded toothpick). But do they really reflect the capital's most popular dish? It's only a matter of time before some enterprising architect seeks inspiration from a half-eaten donor kebab.